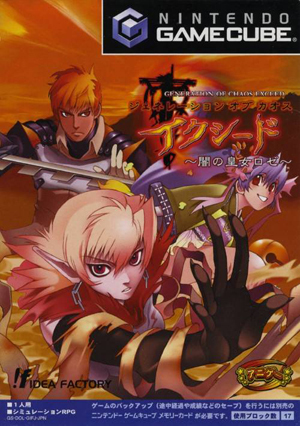 Generation of Chaos Exceed: Yami no Miko Rose (ジェネレーションオブカオス イクシード, Generation of Chaos Exceed: The Princess of Darkness) is a tactical role-playing game created by Idea Factory and released only in Japan in 2003. It is the first and only game of the Generation of Chaos series on a Nintendo console. The game fuses strategy and RPG elements in a turn-based combat system, akin to the Fire Emblem series, but with the addition of larger simulation concepts. The graph below charts the compatibility with Generation of Chaos Exceed: Yami no Miko Rose since Dolphin's 2.0 release, listing revisions only where a compatibility change occurred. This page was last edited on 25 July 2018, at 01:11.